In 1995 my sister died of cervical cancer. In 2001, my mother died from complications of the same disease and in 2004 my father developed a cancerous tumor in his colon and had it surgically removed. His cancer is in remission and he is alive and well at 83. This is my personal recollection and analysis of these and other events involving cancer and my family. Cancer was a major concern of my family since the early 1970s, not because any of us had it but because my parents happen to be Michio and Aveline Kushi, pioneers of the macrobiotic, alternative health and the natural and organic foods movements. In 1971 U.S. President Nixon declared “War On Cancer” and my father and his students decided to direct efforts toward this disease. Around this time, researchers at Harvard University studied the Boston macrobiotic community and discovered how a vegetarian [macrobiotic] diet can lower cholesterol and prevent heart disease. My father was certain that he could show how macrobiotics could reverse cancer also. Conventional medical tactics used in the “War On Cancer” mimicked that of real warfare including surgical air strikes, chemical weapons and even radiation exposure. Cancer is viewed as an enemy that must be eliminated at all costs, even at the expense of the patient. Death is a side-effect risk. In contrast, my father presented macrobiotics as a peaceful solution to cancer and all degenerative diseases of modern civilization. “Modern civilization is the disease and cancer is the cure” he would declare, and the only way to solve the cancer epidemic was for humanity to return to a more traditional and natural diet and lifestyle. In the 1970s my father wrote the his first book, “The Book Of Macrobiotics”. He devised Standard Macrobiotic Dietary Guidelines as a general outline for the U.S. to follow and organized annual “Cancer and Diet” conferences. He expanded his educational organization with new affiliated centers in major cities. His efforts during this time led to many cancer and other health recoveries, the most famous of which was Dr. Anthony J. Sattilaro whose story appeared in Life Magazine and as a book, “Recalled By Life”. There were many other incredible cancer recoveries and some also became books including “Healing Miracles With Macrobiotics” by Professor Jean Kohler, “Macrobiotic Miracle: How A Vermont Family Overcame Cancer” by Virginia Brown, RN, “Eating With Angels; The Neil Scott Story” and “Recovery” by Elaine Nussbaum. In the 1980s my parents began to experience some business difficulties yet in spite of this their macrobiotic educational efforts expanded and many people continued to recover from cancer through macrobiotics. Of course there were clients who did not get well and even passed away but they were seen as being too ill in the first place or as not properly following the macrobiotic advice that was given to them. The recovery successes continued and culminated with my father writing, “The Cancer Prevention Diet” in 1983 which became the bible for anyone wishing to heal their cancers through macrobiotics. Many macrobiotic followers believed that they finally found the “answer” to cancer and that they were immune from the disease as long they ate well and followed macrobiotic principles. This still remains true for some but for many others, a rude awakening was on the horizon. The cancer-free world imagined by the macrobiotic community was shaken up by Lily’s, my sister, stage four cervical cancer diagnosis in 1992. Prior to this cancer was uncommon in the macrobiotic community and the few cases that did occur were dismissed as the person’s fault for not properly following macrobiotics. “You are the cause of your own disease” was the motto of my father’s macrobiotic teacher, George Ohsawa, that echoed in the back of everyone’s mind. These prior dismissals of cancer cases further entrenched my father and his group of dedicated teachers into a food-centric view that all diseases are caused by food as the primary cause and therefore can and should be reversible by foods. People who get sick merely do so as a result of not understanding and practicing macrobiotics and in this way are 100% responsible for their health and destiny. As a result of this view Lily did not see a doctor for regular check-ups while living in Los Angeles. She simply carried on with her life until she became so sick that she could only crawl when she finally called her parents for help on the phone. They flew her back to Boston and again, with out taking her to see a physician tried to improve her health using a variety of food remedies. Her condition did not improve and finally, out of frustration, I and my former wife literally had to hijack Lily into our car and take her to see a physician. We drove three hours north to Maine to see a Doctor who was a family friend and along the way Lily began to realize the severity of her condition. She remarked, “Wouldn’t it be ironic if Michio Kushi’s own daughter had cancer?” When we arrived at the Doctor’s office and my wife took her inside. The diagnosis soon came back: it was stage four cervical cancer. We immediately called my father, who was traveling in Europe at the time and my wife explained to him the diagnosis. He wept. The ride back was somber and my parents came back as soon as they could. After that my sister’s life became a series of hospital visits and radiation treatments. Not long after in 1993, my mother became ill. She was 70 and, unknown to all, had been bleeding for two years and didn’t tell anyone. Like Lily, it never occurred to her to see a Doctor. She even considered it as a possible return of her menstrual cycle. However, with the recent experience of my sister, my father did not hesitate and took her to see a doctor as soon as he found out and the news, once again, shocked everyone. My mother had the same disease as Lily, stage four cervical cancer. If my mother’s illness was spurned on by the burden of her own daughter being terminally ill then she did not show it and instead displayed a child-like aloofness, as was common of her to do, by making light of her hospital visits and marveling at how nice all the hospital staff were toward her. She was in a strange new wondrous world and she embraced it fully. At one point both her and my sister were in the hospital at the same time for their radiation treatments. I do not recall how my father was during this time as I and my wife were busy with the pregnancy and birth of our second child. On the day that our child was born, February 25, 1994, my mother came home from the hospital to be greeted by a newborn granddaughter. Lily’s condition had been somewhat stable, but not improving. Whatever emotional turmoil that my father may have been going through during this time while both his wife and daughter were afflicted with the same disease remains unknown to me as he did not show it. Instead he appeared calm and in control and was always at their side preparing various macrobiotic meals and home remedies for them when he was not teaching and traveling. As the year progressed my sister’s condition worsened until finally, in the hospital, on January 9, 1995, she passed away. I was not present for her final moments but was there shortly before as she lay propped up in her bed half asleep on morphine quietly complaining of the horrible pain she was experiencing. I whispered into ear that everything was going to be okay and to imagine herself floating and in a beautiful dream-like world full of light. She thanked me and feel asleep. I decided to leave as both my father and brother were also present to care for her. That was the last time I saw her alive. I received a call soon after I left saying that she had passed away. While my sister’s health declined in 1994, my mother’s health improved. The combination of the radiation, the food, Chinese herbs and the attention from my father helped my mother to get well. However during this time my mother chose to receive a single radiation treatment internally as opposed to externally as she had been getting. My father was adamantly opposed to it and to this day he believes that it permanently damaged her spine and ultimately led to her death. The radiation fused some of her vertebrae together and made her life extremely painful. It was extremely painful and difficult for her to move around up until the time of her death in 2001. She was either walking with cane, was wheel chair bound, or was bed-ridden. With her improved health my mother was able to travel and attend conferences in the US and Japan. At some events she spoke to the crowd and recounted her illness with a child-like naivete much to the shock of the audience. She would often say how she was just discovering macrobiotics for the first time as well as share how she was able to identify with other cancer patients. and understand what they were going through. In April of 1999 my parents traveled to Japan to celebrate their teacher, Lima Ohsawa’s, 100 birthday and later in July to Washington D.C. to be recognized by the Smithsonian Institution as having influenced the course of American history. After that she did not travel except locally for Kushi Institute events. Her health declined in 2001 and she remained bed-ridden until her passing on July 3. There were no shortages of theories offered from well meaning friends as to why my mother and sister got cervical cancer ranging from foods, genetics, viruses, environmental influences and to emotional issues. One family friend suggested a theory that my mother’s handling of possibly toxic materials while working for her father’s silk kimono business during her youth might have put her at greater risk to cancer. It was plausible but such a theory could not explain Lily’s situation. Michio dismissed this idea since the materials that they used back then were not toxic. Others suggested that their cancers were the result of repressed emotional issues which possibly stemmed from restrictive Japanese social customs and the challenges of living a mission-focused public life of service. Their social, cultural and emotional backgrounds and concerns certainly influenced their behavioral choices but beyond impacting dietary and lifestyle risk-factors it is doubtful and even impossible to determine how much those influences contributed to creating their cancer. The medical science presently views the human papillomavirus (HPV) as the primary cause of cervical cancer. According to the Center for Disease Control (CDC) approximately 20 million Americans are currently infected with HPV. Another 6 million people become newly infected each year. HPV is so common that at least 50% of sexually active men and women get it at some point in their lives. While it is considered to be primary cause of cervical cancer it is similar to the relationship between cigarette smoking and lung cancer. Most people who have cervical cancer have HPV but there are some who are exposed to it that don’t get cancer and there are some who have cervical cancer who weren’t exposed to HPV. But otherwise it is clear that it is a major contributing factor. It is possible that they both contracted HPV. We will never know for certain at this point. However, according to macrobiotic theory, viruses are not considered to be the cause of any disease but instead are thought to arrive only after our health and immune system has been weakened and compromised by other factors such as poor eating. Viruses may help to accelerate a problem but they are definitely not considered to be the cause of an illness. Other factors medically known to increase cervical cancer risk are a diet lacking in fruits and fresh vegetables and exposure to smoking. These factors were present in their lives putting them at a higher risk for cervical cancer. From a food perspective my father attributed my mother’s condition as being the result of her eating too many “yang” foods such as deep fried sour-dough bread, kombu chips and other similar things and not having enough “yin” foods like salads and fruits. He believes that my sister must have had a similar diet. Why Couldn’t They Tell How Sick They Were? Perhaps the most troubling question, especially from a macrobiotic health point of view, is: “Why couldn’t they tell how sick they were?”. One of the most important concepts of macrobiotics is that it places the responsibility of one’s own life into one’s own hands. By understanding the forces of the universe and monitoring and being sensitive the effects of the foods one eats then we should be able to maintain our health throughout our lives. How is it that neither of them could tell how sick they were? I believe the answer to this is fairly simple. Cervical Cancer is medically known to occur and grow undetectable and by the time the host person actually feels it, it is usually too advanced. This is what happened with both my sister and mother. By they time they actually did have a medical diagnosis their cancers were very advanced. From a macrobiotic perspective one could say that extreme yang conditions like cervical cancer, pancreatic cancer, liver cancer and heart disease grow relatively slowly, quietly without notice while yin conditions like skin, breast and stomach cancer grow faster and are noticeable early on. If someone falls into a pattern of living and eating more on the yang side, they can develop various problems over time without being aware of it. Therefore the only way to prevent us from falling into this trap is to maintain a fairly wide healthy diet that is on the yin side together with having regular health check-ups and evaluations. From a medical point of view it is impossible to determine the exact cause of my sister and mother’s cancer. Aside from a general conclusion that they most probably were exposed to and contracted HPV which caused their cervical cancer the exact reason why they became sick is a medical mystery and will always be so. From a macrobiotic perspective, dietary and lifestyle factors are the principle cause of their problem. Yet, given who they are with their years of macrobiotic experience it seems contradictory to make such a conclusion. I believe the reason for this isn’t so much because of who they are but more because of the inadequacy and misconceptions of the present and popular definition of macrobiotics as a narrow cancer cure diet. The area of diet and lifestyle that macrobiotics encompasses is actually of a scope much larger than just eating brown rice and organic vegetables as a magic remedy to cure all cancers. When my mother passed away in the summer of 2001 I was managing the Kushi Institute. I was a regular teacher for the Institute’s Way To Health Program and shortly after she passed away I was scheduled to give a talk in front a group of cancer patients eager to learn the macrobiotic way. I found myself in the potentially contradictory position of announcing my mother’s cancer death while, at the same time, attempting to inspire those whom sought out macrobiotics for cancer relief. In contemplating how to address my unique dilemma I began to realize that the words I was planning to give extended far beyond my responsibility as Executive Director of the Kushi Institute. I felt for the first time (and it would not be the only time) as though the burden of the entire macrobiotic movement rested upon my shoulders alone. The woman whose cancer death I had to announce was not just anyone who may have had some remote relationship to macrobiotics. No, she was the exemplary symbol to many of what macrobiotics was all about. My presentation had to be honest, make sense and be inspirational and I had to succeed. Failing this task would have been disastrous for the Kushi Institute and for macrobiotic movement as a whole. Under this immense pressure I gave the following presentation and no one asked for a refund and no one left the program early. Premature death can occur due to drastic shifts in the natural environment. Hurricanes, earthquakes, severe storms are some of the various naturally occurring disasters that can take someone’s life away. Improper healthcare and nutrition, lack of food, poisons, exposures to malicious viruses and bacteria can also lead to death. Social situations such as war, conflict and murder also cause death. As humans living on earth, we are constantly reminded of the perils of the first three categories and we do our best to avoid premature death by these influences. These areas of concern are further detailed below and include the not-so-obvious fourth category, “Feedback” or an awareness of our situation. Awareness and concern for the natural environment includes attention to one’s location and geography, the changing seasons, changing weather conditions, the quality of available water and more recently, the quality the of air. These factors are a concern to us all and most developed societies have created appropriate safeguards to minimize the impact from these life-threatening natural forces. Today, medical science has developed effective infrastructures that handle immediate emergencies and crises using a variety of life-saving measures. Furthermore, with the integration of Western and Eastern medicines, modern and ancient techniques, conventional and alternative approaches, the future of medicine promises a comprehensive integrated approach to address all forms of health challenges. Modern macrobiotic promoters have emphasized the importance of the proper foods for prolonging one’s life. Concerns regarding food can be divided into four categories: 1.) Selection, 2.) Proportion, 3.) Preparation and 4.) Method of Eating. Preferred selection of food includes, choosing more natural, whole, organic, and fresh ingredients. Traditionally processed foods are preferred over newer techniques that require chemical additives or unnatural procedures. Regarding proportions, Macrobiotics principles emphasize a whole-grain centered plant-based diet with less animal products normally consumed. Michio Kushi has developed “The Great Life Dietary Pyramid” that outlines recommended dietary proportions. The macrobiotic preparation of food is the application of ancient yin-yang principles of balance. By understanding and utilizing these principles, macrobiotic food preparation aims to achieve two primary objectives: 1. To make foods edible for human consumption and by doing so, promote natural human evolution and 2. To serve one’s life ambitions and dreams. Proper eating methods include cleanliness, chewing well, eating regular meals, sitting down while eating, eating dishes in proper order, and not over eating. These suggestions on the method of eating are basic and commonly known but less frequently remembered and followed. The impact of our social environment on death should not be underestimated. Social concerns include all human relations, communication skills and awareness of one’s position and social tradition in relation to the rest of society. Happy and harmonious relations, a supportive network of family and friends, effective communication skills and an awareness and freedom from the influences of one’s personal and inherited patterns and daily habits are critical to maintaining one’s health, minimizing conflict and creating a social infrastructure that can be called upon in times of life-threatening crisis. Furthermore, a clean home environment, an orderly private and social life, and attending to one’s obligations are essential to reduce stress and sickness, which, in turn, minimizes the risk of potential accidents, and can also serve to eliminate life-threatening conflicts. The fourth category, “Feedback” is not so obvious in its importance but is as vital as the other areas in avoiding premature death. Monitoring an immediate situation or the failure to do so can mean the difference between life and death. Life and death can be a matter of a split second, the distance of a millimeter, or a simple miscalculation or misinformation. Accurate “Feedback” minimizes the chances of death and can range from radio contact on a battlefield to ongoing and regular medical check-ups to simply reviewing and assessing the quality of one’s own stool. Such critical information allows one to make informed choices to avoid perilous situations. Feedback is usually instinctive, but when we lose our instinctual capacities or when they become impaired, then it becomes critically important to intentionally obtain accurate and regular feedback from sources beyond one’s self. In summary, the person who addresses and monitors all four areas of concerns builds the necessary foundation for a macrobiotic life; a life that, by definition, belongs to one whom has lived long and dies of no other cause than old age. Those who have achieved this may have faced numerous life-threatening situations from war, serious and debilitating illnesses, and other challenges yet have been able to overcome them all. They may be wealthy or poor, famous or unknown, law-abiding citizens or outlaws, heroes or villains. Status has no bearing. The only measure is how they died. A life that ends in natural death by old age is the ultimate expression of living life to its fullest and is a macrobiotic life. How Do These Four Areas Apply To Aveline Kushi And Her Cancer? First, it should be noted that statistically there is only a 15% 2-year survival rate for persons diagnosed with stage IV cervical cancer. My mother lived a total of eight years beating those survival odds with the help of radiation treatments and my father’s macrobiotic guidance. Influences from the natural environment can be ruled out. My parents and others, including myself, lived in same the natural environment and yet only my mother (and sister) developed cervical cancer. If natural environmental influences made a difference then we all would have been afflicted in a similar way. As mentioned previously, HPV is medically considered to a primary cause of cervical cancer. It is possible that my mother contracted the virus but it is unknown. However, also as mentioned, the macrobiotic view does not really consider viruses to be the initial cause of disease. In reviewing their cases recently from a dietary perspective I found a common bond between both Lily and my mother. In the 1950s while living in New York City and while there were no natural foods anywhere available, my parents had to make do with whatever foods they could find to eat. My father frequently ate in diners and coffee shops while my mother maintained a very simple and narrow diet avoiding all sugar pastries, coffee, raw salad and other yin foods that he often enjoyed. She ate oatmeal, white bread, noodles and whatever fresh vegetables they could find. The one animal food product that my mother liked were grilled cheese sandwiches which she enjoyed throughout the 1950s until 1959 when George Ohsawa came to visit them and told her to stop eating them. My mother continued to eat “yang” foods including bread, cookies, crackers, kombu chips and so on up until her death. Lily also had an affinity for grilled cheese sandwiches and white flour products such as saltine crackers which she continued to snack on daily until becoming ill.
For methods of food preparation Aveline frequently enjoyed deep frying foods and baked sour-dough breads. She would take the burnt bottom rice and roll it and slice and deep fry and eat it like a snack. All of these types and methods of cooking were on the “yang” side. She remarked herself on her deathbed that her home cooking style was overly yang for herself and more designed for men in consideration of her husband and four sons. After hearing about my mother and sister’s eating patterns from me one macrobiotic counselor remarked that he observed how eating something extreme has a much greater impact on someone who has been eating a simple and healthy diet than on someone who has been eating wider. In others words, when one is healthy it is better to a more wider diet in order to minimize the negative effects of any one single food item. I believe this could apply to both my sister and mother as they both ate a fairly narrow diet of simple foods yet then had an attraction to baked flour products, cookies and crackers. So while the quality of the foods that she chose may have been excellent (organic, whole, natural foods) and while she had excellent food preparations skills, my mother’s own personal diet was overly yang foods and preparation methods (breads, bottom rice, deep frying and baking) and was lacking in yin foods and methods (greens and raw foods). Another area related to food that she did not handle in the best way was how she ate. She prepared meals for an entire household of not just family members but for an additional 10 to 20 friends and students who shared our home. She rarely took the time out to sit down for a meal herself and would always see to the needs of others first. Naturally her diet was affected by this. The combination of all of the above provided a potent mix for an unhealthy life in spite of educational message and mission of macrobiotic health. There may have been social issues including marital issues, family disagreements and financial and business problems as well as some unfulfilled and broken dreams in my mother’s life that may have troubled her and had some impact on her health. But such issues are not uncommon and they are experienced by many families. What is unique to my mother was her background and upbringing and her mission focused life that she adopted from her parents. These things helped to shape how she would respond and react to future situations which was mostly her handling her problems on her own and refusing to seek out help from anyone. My mother grew up in pre-World War II Japan where women were encouraged not to ask for themselves and to serve others first. She was raised in a country that valued national ideals above those of the individual. She was raised in a large family that encouraged missionary ideals. The combined effects of these social influences deeply embedded in her an attitude of selfless service and a denial of personal needs. With her later life in the US she and my father surrounded themselves with many students for whom they constantly tended to. Hence, when she bleed for two years it was quite natural for her not to bother or tell anyone, including her own husband. This leads us to the fourth and perhaps most important area of concern for macrobiotic success. Had my mother continually monitored her own health by visiting doctors regularly or even questioning and reviewing her own diet and way of life, she may have been able to prevent not only her early death but even the occurrence of cancer. Not only that, had she constantly reviewed her life she may have decided to take it into an entirely different direction. We don’t know, but one thing is certain: her failure to monitor and provide her own feedback greatly contributed to the spread of her disease. STOP! Do you like what you read here? Then help me by clicking this link: DONATE Thanks! It takes a lot of courage to write about this topic when your own name is Kushi. Both your sister and your mother were wonderful people. It is said that 80% of all cancers are avoidable through diet and lifestyle. That still leaves 20% due to environmental issues, virus, parasites (a common cause of gall bladder cancer in South East Asia), genetics and probably a very small percentage due to emotional distress. Thanks for writing about this. Looking forward to reading part 2. This is such a brilliant presentations and to share story of your Mother – the Beloved Aveline and your sister – the Beloved Lily suffering from the cervical cancer are so courageous of you. There are so many lessons to learn from your articles and to apply them to our personal lives. I have never attended any of the seminars available at The Kushi Institute, but perhaps someday I would. All of your articles are so valuable and easy to read and understand and become my inspirational to my journey as a new comer in macrobiotic and for other people as well. Thank you again for posting the articles. 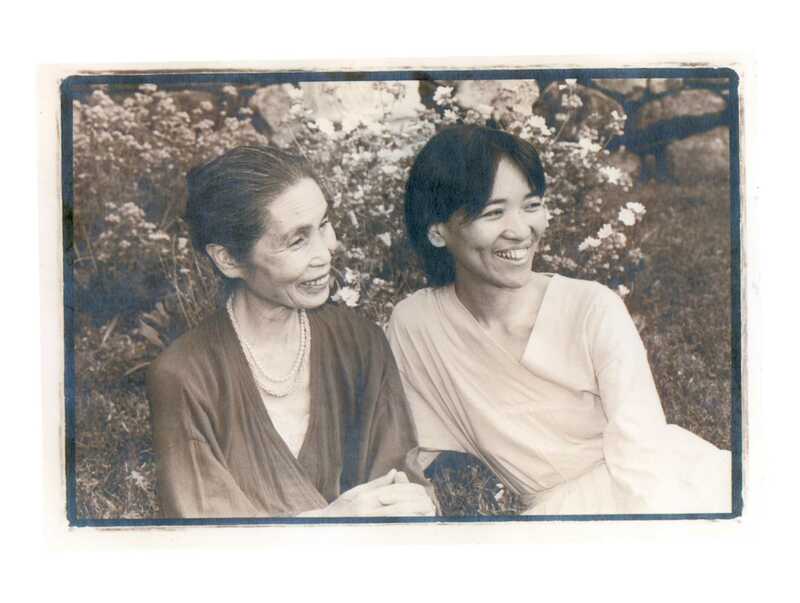 Thanks you Phiya, I attended seminars with your mum and dad in the ’80’s and your kind words give strength to their macrobiotic vision. How very brave of you to tackle this huge challenge – and as all your writing, you do so honestly. One niggling question comes to mind – don’t know if you are ready to be public about it – but wonder how you bring all this home to your own life. I’m certain all who read also have in the back of their minds, how it applies to their own practice. Thanks for sharing Phiya … waiting for part two !! Thanks for sharing Phiya!! Very moving….but very understandable….awaiting part two!! Thanks Phiya! Very honest and Open. ..waiting for part two !! As we desire this great gift of eating to a natural way, we are born into a world filled with shared difficulties. As I know the gifts Aveline gave to me, the dream continues. She continues and her love of grilled cheese was enjoyed in the moment she ate them.- Yes- we are human- Yes- as Michio has described- there is not perfect health, yet a movement in all of the worlds- in this great universe. As the gift of your family gave to the world, the front became a back in a glimpse of the life of both of these beautiful women. Phiya, I remember living with your mother and father in Brookline, and have pondered on the cancers, Your mother would look at me and say Claire I want to stay here and eat your food but I have to go out, she eat everyone’s food, I never did, and I always thought she gave her life for the furtherence of one peaceful world, how many of us can say that, and if she found some comfort in her yang choices so what, she was able to cope with the vast amount of people in her life this way, still remember her showing me how to wash the wooden spoons, when I washed one of the downs I slept on, oh Claire not this way, so much she had to put up with, and who knows how long she would have lived if she hadn’t found rice and miso soup, maybe half the amount she did live. I always think our bodies get literally rusty, little brown marks, appearing darn it, so how do we dissolve the rust everyday, she put us on the path and now we make discoveries in our own bodies that one day work next day not, how long do we want to live each one of us, she was done, and now its our turn to take responsibility for our own bodies and stop blaming others and germs and viruses etc, I don’t know and have never cared for the mechanics of the body maybe I am lazy, to learn, I just know when I put something in my mouth its going to do something never nothing. Since I have heard of all of these deaths in the Macrobiotic family, I have kept my thoughts to myself. I knew of everyone’s hopes about what macrobiotics could do for themselves and the world and even feared that these deaths could in some way hurt the movement. I have no fear anymore because it is normal to forget what wisdom has been passed on down through the ages from the sage teachers during the age of the Yellow Emperor’s. But the truth cannot be lost forever because our minds are eternal and one. We…and I mean all of what we are, cannot go anywhere. We are as much a part of the universe as anything else and nothing in the universe could exist without it all being here. All the “wise men” and, “wise-women”, and all the teachers are with us still and until the end of time. If it were not so there would be no point to anything. There would not be anything to change for the better, or anything to learn or love. We…are the luckiest people in the world because we know a way to happiness and freedom that few in the world know. In the end, for me, I at least know that when I die, it will not be the stupid boy I was before being handed a copy of “Zen Cookery” in 1965. I give praise to all who teach whatever they have learned because this is how we show our love. Thank you Phiya for sharing. It has been very meaningful for me to read this as I’m sure it is also for anyone involved in macrobiotics. Loving blessings to you and your family. I am much obliged to you dear Phiya,you have no idea how much it is useful,really thanks. It takes courage to share this. Thank you. I came across your blog by accident and what a wonderful accident. Written beautifully with honesty and great courage. This is a touchy subject for sure, considering . . . . I just recently discovered macrobiotics but have been careful with my eating habits for some time. What is amazing to me is that while reading Michio’s book I’ve proved to myself many facts about food that I’ve collected around investigating and they seemed as the only logical way of living. Macriobiotics is not an invention of one man but more like a collection of world’s wisdom and as such it can’t be guilty for such disease. As you said, we are all human with our personal issues and we are all going to die but the way of living is what matters. I remember the deep fried burnt bottom rice. Well-writ author, thank you for you honest. I want to chime perhaps more harshly. There is now ample proof that rice, ESPECIALLY brown rice, is poisoned from decades of crop spraying, with arsenic, a known cancer causer. This is true for organic rice also, tho less so. This toxin cannot be removed by the body as it is non-organic arsenic. It is probably fruitless to even examine beyond conjecture the role brown rice played in promoting cancer in these folks, including Michio, whose insouciant attitude toward smoking, and severely limiting water, etc, etc, could not, in addition to daily eating of brown rice, possibly have helped (him) in any way. Info on arsenic is EZ to find, from a simple search: “arsenic rice”. Particularly look for: Consumer Labs’ test, and also the FDA’s followup test–the results are very worth knowing, especially for those who believe(d) that brown rice is a magic food with all sorts of para-caloric abilities. Great and truthful revelation about his mothers and sisters cancer.nobody is perfect in his life style and diet,we can all get cancer any time.I raised a familie with fife kids on macrobiotics and they grew up to be strong adults. Thanks the macrobiotic movement. I passed through the Brookline/Becket Kushi experience in the late 80’s , despite the politics & isms & disms I had the most wonderful time of my life as if vacationing with my favorite aunt & uncle. I shall always be grateful to them for being exactly who they where. So good to read this as I am going more deep in the study of macrobiotics. it helps me not to take anything for granted, but always question again for myself & to reflect.